With BGR support, during 2018, HKI expanded their EHFP project to the provinces of Hoa Binh, Son La, and Lai Chau, which is one of the poorest areas of Vietnam. In July, the latter two provinces were heavily hit by tropical storm Son Tinh, which caused flash floods and landslides, but the program’s goals were successfully reached in all areas. These goals focused on alleviating hunger mainly through training mothers and pregnant women about nutrition and horticulture. 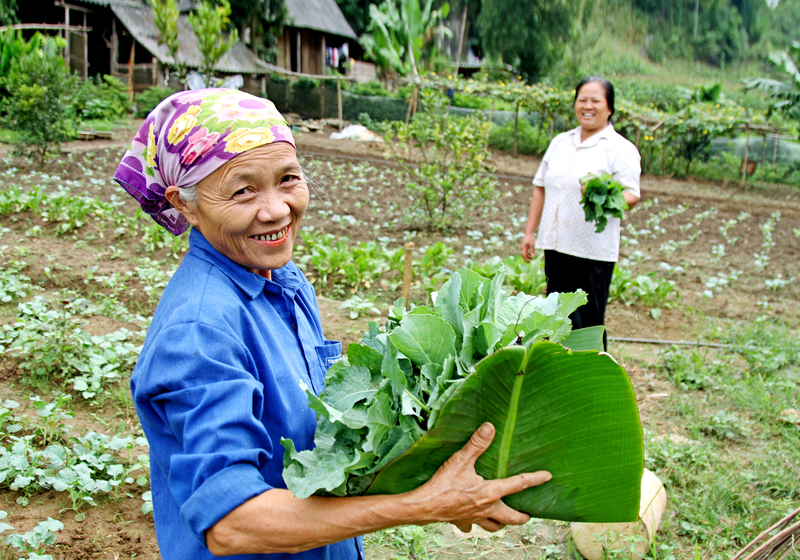 Many women were trained in making home gardens, so they won’t have to spend so much time and effort foraging for vegetables in the forest. This includes simple gardening practices like introducing raised beds and use of fences, as well as the use of organic fertilizers and herbal pesticides. They also learned about the importance of having a diversity of vegetables, whereas many only grew cassava or corn, due to previous problems with worms and summer water shortages. Subsequent data reported that 95% of households with pregnant women and children used their home gardens. Mrs. Giang Thi Ly, a 24-year-old Hmong mother in Lai Chau province, said that it previously took her half a day to go to the forest to pick vegetables, but now it “only takes a few minutes to have clean and fresh vegetables for family meals.” She also said that she was now able to know which vegetables are rich in iron and vitamins, as she and several hundred other women were trained to name at least three vitamin-A rich foods and at least three iron-rich foods. They were also given training in proper handwashing, which prevents many illnesses. In addition to such nutrition, horticulture, and communication training, seeds were given to a targeted 618 households, and more than 7,000 ducks and chickens were vaccinated for infectious diseases and then given to 346 households, so they could have a steady supply of eggs. These families now not only save money, but many households were even able to earn extra income by selling surplus produce at local markets. Finally, two nutrition day festivals celebrated the new awareness of nutrition and health care, with over 1000 local people attending. In group sessions, people developed a full-day menu using locally-available, nutrient-rich foods particularly for pregnant women and children under two. Also at these festivals, 300 children under the age of five were examined by local doctors regarding their nutrition status, and mothers of any malnourished children were counseled by nutrition specialists. Taken altogether, the BGR–HKI partnership in Vietnam has clearly improved the health and lives of many mothers and children, and in doing so it has improved Vietnamese society. By supporting such projects as HKI’s Enhanced Homestead Food Production, Buddhist Global Relief is showing us that by focusing on alleviating hunger and malnutrition through specific strategies in poor areas, we really can make a difference. 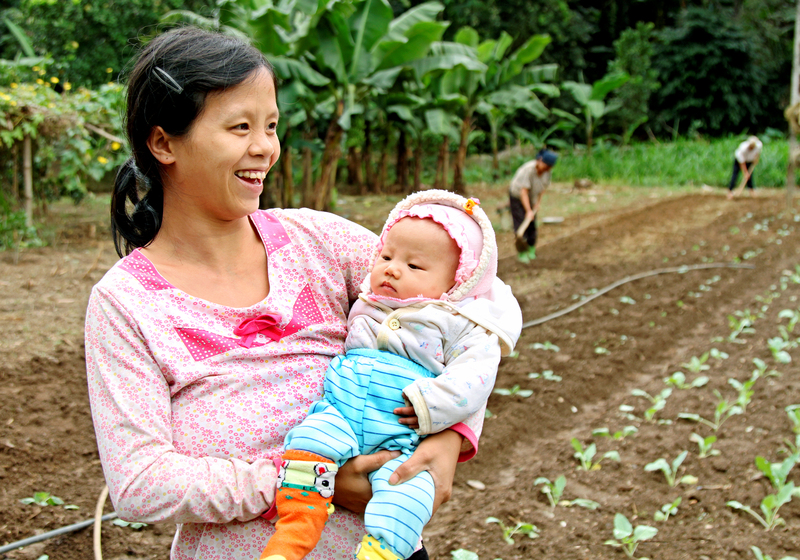 “Thanks to EHFP, we can have various nutritious vegetables for our family’s health.” Mrs. Giang Thi Ly is a 24-year-old Hmong mother who lives in Chu Va 8 Village, Son Binh Commune, Tam Duong District, Lai Chau Province. Since her participation in HKI’s Enhanced Homestead Food Production project, she has found a way to improve her family’s meals with the fresh vegetables she planted in her home garden to diversify the family diet. Before, her family only had a small, 800 square meter garden, and she only grew corn or cassava because of concerns such as worms, water shortages in the summer, and lack of seeds. As a result, her family did not have a variety of vegetables and fruits easily available for meals. They often had to spend entire days collecting vegetables from the forest. When, however, she attended HKI’s training courses on agriculture, she learned about soil technology, bedding, seed preparations, herbal pesticides, and fertilizers. More importantly, after she completed the training courses, her family was provided with eight different kinds of seeds to sow in the spring. Her garden now has more than eight different kinds of vegetables. “Now, I don’t have to go to the jungle to harvest vegetables. Instead of spending half of my day collecting vegetables, I only spend a few minutes picking fresh and safe vegetables for my family’s meals. Thanks to HKI, we can have a variety of nutritious vegetables for our family’s health,” she shared. Thanks to the project, Mrs. Ly and her family have increased their knowledge about agricultural technology and feel their quality of life has improved. She is thankful that HKI and Buddhist Global Relief have invested in improving the agriculture and nutrition of her community. “Thanks to HKI’s project, I have completely changed myself.” Mrs. Bui Thi Linh is a Muong woman living in Chieng 1 Village, Tan Lap Commune, Lac Son District, Hoa Binh Province. She is 28 years old and lives with her husband, five-year-old child, and parents-in-law. As one of the project’s outstanding trainees, she was chosen to be a nutrition facilitator for Chieng 1 and Chieng 2 villages. Before, Mrs. Linh was timid and shy when giving presentations to a crowd. Like other women in the village, she was afraid of strange people, and sometimes she avoided sharing her experiences around nutrition because she did not want to speak before an audience. Thanks to HKI, however, she had the opportunity to participate in training courses and learn about nutrition and facilitation skills. After these training courses, she was coached and mentored by technical teams from HKI, the district, and the commune health station. She became confident speaking to people in public places because she wanted to share the information she had learned about nutrition and safe food production. Thanks to HKI and BGR, Mrs. Linh has learned more about herself and developed confidence in skills she never realized she had. “I have completely changed myself to do things which I had never done before,” she said. This entry was posted in Agriculture, Ending global poverty, Engaged Buddhism, Food insecurity, Nutrition, Projects & programs and tagged Engaged Buddhism, Global hunger, Helen Keller International, sustainable agriculture, Vietnam. Bookmark the permalink.